The big tag line for Microsoft's announcement of the new Surface Pro 3 earlier today was that this is "the tablet that can replace your laptop." This isn't the most surprising tag line, because since the inception of Windows 8, Microsoft has been trying to push the idea that it is a "post-PC" company, mostly by pushing manufacturers to create hybrid devices and tablet convertibles that would replace traditional laptops and desktops. The plan has had somewhat mixed results. Many consumers aren't really on board with the new Metro/Modern UI, which essentially means that they aren't all that interested in Windows 8 and any tablet/hybrid devices running the system. However, those in the market for a new computer have found that many times, the best option is a hybrid device, even if they don't have any real interest in using said device as a tablet. Despite the early hype, consumers seem to be coming to realize that tablets are not really going to be full laptop replacements, at least not in their current form with current software and input offerings. We talked recently about how tablets are far more niche devices than one that will ultimately continue to steal market share from PCs. This makes Microsoft's latest announcement all the more strange, especially when compared to what we've been seeing from the competition. If you haven't seen all of the other posts on the topic, the Surface Pro 3 is a somewhat strange update in general. The one major upgrade to be found with the Surface Pro 3 is in the display. The screen on the Surface Pro has grown from 10.6-inches to 12-inches and increased its resolution from 1920 by 1080 to 2160 by 1440, but the pixel density has only increased from 208 to 214.5. This increase in display size has obviously caused the overall footprint of the Surface Pro to become larger, but Microsoft is really showing off its hardware skills with the Surface Pro 3, because it looks like an extremely well engineered device. The tablet's aspect ratio has been altered from 16:9 to 3:2, which is a great idea that should make it easier to hold. But, the really impressive change comes in how Microsoft managed to make its tablet much thinner at .3-inches (9.1 mm) compared to .53-inches (13.46 mm) and a bit lighter at 1.76 pounds (800 g) compared to 2 pounds (907 g), even though it is using components that needed a lot of work to fit into such a thin frame. The thinner profile and lighter weight should make the bigger size more bearable, but the trouble is in the fact that Microsoft hasn't really upgraded the internals. Rather than truly upgrading the internals, Microsoft has opted to simply offer more choices in terms of CPU with the Intel Core i3 and i7 in addition to the same Core i5 that you'd find in the Surface Pro 2. The Surface Pro 3 is still using the same 4th generation Intel Core chips, which isn't really Microsoft's fault as Intel has had to delay its 5th generation Broadwell chips. It does mean that Microsoft's new flagship tablet is using a year old processor, but at least the processors will be clocked a bit higher. The Core i5 in the Surface Pro 3 is clocked at 1.9GHz (2.9GHz turbo) whereas the Core i5 in the Surface Pro 2 is clocked at 1.6GHz (2.6GHz turbo). Microsoft will frame the conversation as the Surface Pro 3 starting at a lower price (with the Core i3) and offering faster speeds, but it's unclear if that will actually be true. Having a larger display with a lot more pixels to push will require more work from the chipset. The Core i7 model should be able to make up the difference, and the Core i5 model may as well because of the faster clock speed, but all of the Surface Pro 3 models use the same Intel HD 4400 GPU. The GPU will be responsible for most of the increased work with the new display, but with no upgrade there, it's hard to say what the performance increases will really be. Though, to be fair, buying a Surface Pro for gaming is basically asking for trouble, because there are very few quality touch games available, and with an Intel HD 4400 GPU, there are very few traditional games available either. Aside from those items, Microsoft is claiming more battery life, louder speakers, more control over the angle of the kickstand, and a better Surface Pen. All are nice-looking updates, but it is unlikely that any of them will move the needle too much for consumers. On the Surface Pro website, Microsoft compares its device to the MacBook Pro, but the real comparison should be with the MacBook Air if Microsoft really wants its tablet to be a replacement for your laptop (and the MBA is what Microsoft used as a comparison during its announcement). In that head-to-head, the Surface Pro 3 boasts a touchscreen, a faster processor (its Core i5 is clocked at 1.9GHz compared to 1.6GHz of the MBA) and it is thinner and lighter size. Of course, it should be noted that the Type Cover is listed as optional, which means that in order to truly replace your laptop, you'll have to pay extra for the keyboard; and, when you add in the Type Cover, the Surface Pro 3 comes to a combined 2.38 pounds, which is almost the same as the MBA. The Core i5/128GB Surface Pro 3 alone costs the same ($999) as a 13-inch MacBook Air with similar specs. But, the Type Cover will add another $129 to the price, and if you want Microsoft Office, that will cost extra as well. Those two extra costs actually would end up putting the total for a Core i5/128GB Surface Pro 3 that could replace a laptop at $1267, which is a sizable chunk of money. No doubt, the Surface Pro 3 with a Type Cover could do quite well in terms of replacing a laptop, but the question remains: is there a benefit to doing so? For the money spent on a Surface Pro 3 with Type Cover and Office, the only real benefits over a comparably priced laptop would be in the touchscreen (vs a Mac, but this isn't an advantage over other Windows 8 laptops), the removable keyboard (aka the tablet functionality), and in the Surface Pen. The touchscreen is a very nice addition to a laptop replacement, and it seems reasonable that most laptops of the future will feature touchscreens; and, a touchscreen is a big benefit on a Windows 8 machine, but that's mostly because the system is simply more intuitive with touch than it is with a keyboard and mouse (though Microsoft has been fixing on this as well). The Surface Pen could be very useful for some users, like students, enterprise users, and doodlers, but it doesn't really add a huge amount for most users. That just leaves the thorniest proposition of all: choosing the Windows tablet experience over Android or iOS. The Windows tablet experience is still a work-in-progress. The experience is getting better, but is still lagging behind. The Modern/Metro UI isn't as mature as Android or iOS, legacy apps don't work well with touch, and the Metro app ecosystem is still missing quite a lot. This could be changing fairly soon with the new universal app development tools that Microsoft showed off last month at its Build developer conference, but that doesn't help users right now. And, that doesn't even mention the usability issues inherent in the Surface Pro 3. Sure, the device is thinner and lighter, but it is still much larger than any tablet out there, including Samsung's Note Pro 12.2, which has a larger display (and higher resolution) and is still thinner and lighter. The iPad Air is far lighter than the Surface Pro 3, and even the year old Nexus 10 is almost half a pound lighter than the Surface. Of course, none of these comparisons hit the real selling point of the Surface Pro 3, which is the convergence factor. Sure, for just $100 more than a Surface Pro 3 with Type Cover and Office you could buy a MacBook Air and an iPad mini Retina (or ring up a lower overall total, by swapping the iPad for a Nexus 7). And sure, owning a proper laptop and a tablet as separate entities could mean better experiences with the tablet usage. The real benefit of the Surface Pro 3 is having it all in one device, even if you run into the troublesome "jack of all trades, master of none" issues. Convergence is a great dream, but so far the reality of convergence hasn't been so sweet. We've seen plenty of visions of what convergence could be. Canonical wants one OS that runs on all devices, and the same app simply modifying its UI based on the screen being used, but Ubuntu is still a couple years away from that. And, even if Ubuntu does pull it off, it doesn't have the mass market appeal of its platform or brand to do too much. Apple has the mass market appeal, but has stated that it doesn't plan to converge MacOS and iOS. Google's mobile offerings are huge, but its PC offering with Chrome OS is still very polarizing, especially with power users. Microsoft has the mass market appeal for its desktop products, but not so much for Windows 8 specifically; and, it doesn't really have the appeal for its mobile offerings. However, Microsoft may also have the shortest distance to go in order to reach the convergence goal. Windows Phone and Windows 8 already share a core, and developers can now basically write once and have their apps run on all devices. Windows "tablets" are getting into the hands of more and more users in the form of hybrid devices, but many users still don't really use those devices as tablets. Mostly, those devices are simply used as ultra portable laptops. Windows Phone is also growing in popularity, but it has a long way to go to catch the current market leaders. In the end, users still don't have a true all-in-one solution. Everything has a trade-off, and right now, the best a user can do is choose which downside hurts the least. If you don't necessarily need to have the power and functionality of a full laptop with you when you're on the go, you can buy any of the myriad tablet options already on the market with full app ecosystems of Android or iOS. If you need a full laptop with you at all times, but don't need the tablet functionality as much, there are plenty of great ultra portables to be had. If you need both, and don't mind weighing down your bag a bit, it's easy enough to get both an ultra portable and a tablet. There have been devices announced that would offer Android tablet functionality mixed with a Windows 8 laptop in different hybrid/convertible devices, but recent news has said that Microsoft and Google don't want you to be able to purchase those devices. Those devices would have gone a long way to mitigate trade-offs by offering the Windows laptop experience with the Android tablet experience, but even those would have still had drawbacks in that your data would likely stay separate between the two operating systems. Unfortunately, it doesn't look like those devices will ever see market, which means a lot more work for consumers. If you're in the market for a smartphone or tablet, there are a lot of choices, but they can be broken down pretty easily. If you want a true all-in-one, your only real option is with a Windows device, but there are sure to be a number of caveats in terms of what that device can do with respect to what you would want from it and how much it will cost to get everything you want. Of course, there is a silver lining to all of these troubles - we're getting closer. The Microsoft Surface Pro 3 has fewer faults than the Surface Pro 2, and the Surface Pro 2 was better than the OG Surface Pro. Microsoft has the development tools in place that could finally bring an end to the app gap that is still the main complaint for the Windows tablet ecosystem. And, Microsoft is proving that it can both build impressive hardware and make a compelling platform (or at least heed the complaints lobbed at it). 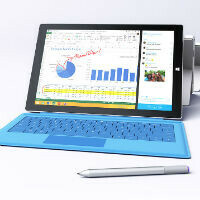 Windows 8 is getting better, the Surface Pro 3 is better hardware, and the apps might be coming. Sure, there are troubles. The apps might be coming, but they also might not. The Surface Pro 3 is better designed, but Microsoft is at the mercy of Intel in terms of upgrading the internals properly. And, no matter how much better Windows 8 might get, it may still not be the right OS for your preferences. But, at the end of the day, Microsoft has the inside track on making convergence a reality before any other company. The Surface Pro 3 is another step towards that goal. Each separate device category has limitations in the form factor, none more so than laptops and tablets. The Surface Pro 3 may not be there yet, but it certainly proves that Microsoft won't stop until it solves the convergence puzzle. They can easily have 2 surface pro's. The one with premium built quality and all the features. And one thats made out of plastic, not as much thin, and maybe lower resolution, and I am sure it could cost around 600$ which would be pretty good for a full windows tablet/ultrabook with i3/i5/i7 cpu. Just don't see it. Microsoft could put out a truly useful tablet for a lot less money than Surface 3. It's unclear if there really is a large market for notelets/tabbooks. It's the price that is the deal breaker here. MS cut it down!!! You'll my money in no time. Hehehe. If $700 is too much for a Haswell-based system, then look at the Asus T100 if that's all you can afford. In about 10 seconds you'll realize why the Surface Pros command a higher selling price. And if you don't, it's screen quality/resolution, build quality, and peripheral options. When you talk about "build quality", are you including the POS N-Trig pen that the Surface 3 now has instead of a high quality Wacom pen? Compared to buying an ultrabook+tablet. Both approaches have tradeoffs, but if they want to 'solve' the issue of the convergency and that people buy only one device instead of two, the surface should cost less than buying the two devices. If not the decission can go either way. Care to point me to a ultrabook with similar specs and cheaper ? isn't sony vaio z ultrabook's their 2012 lineup? tho, sony vaio pro is about same price, and not much heavier, but it won't be as portable (in my opinion). But till the end, don't we have all those great products so everyone could choose what they like the most? for me it will be a surface pro, since I like laying in bed with a tablet, but I also need a laptop, and frankly quite bored having 2 keep lot's of same files on 2 different things. most of the zseries with similar specs was either the same or more expensive. Though i didnt do a die hard search like some would. How is this more expensive than buying an ultrabook+tablet? Since when 1128$ is more than around 1000$ for a ultrabook + another 300-400$ for a tablet? Exactly. How is $700 dollars too much for a Haswell-based laptop/tablet that can run circles around it's ARM counterparts. Needless to say, I'll be selling my Surface Pro 2 for the 3 in the near future. Yes iPad is way to expensive and limited .....like ChomeOS! Give me something capable please! SP3 700 I agree is a little much for my budget but if I sell my tablets I have maybe I can pick on up ! Office may not be free in OSX, but their Apple equivalents now are, that's why they are adding that cost. http://www.macworld.com/article/2056159/what-you-need-to-know-about-apples-free-apps-policy.html If that's fair or not it will probably depend on the user and how much the like the MS Office. Its apple's software offer, but that doesn't mean is a Office equivalent. There are plenty of free office suits that should be on level with apple's offering.. Or even office online.. Comparing the Surface Pro 3 to the MacBook Air would be dumb. The SP3 is way more powerful than the MB Air, and also, offers a touch screen, and IMO a better overall OS. Now I know iFans will disagree. But the SF3 is the REAL deal. Its the ULTIMATE tablet or ultrabook hybrid we've been waiting for. I hope MS get it out in India soon! Not the reviews I watch from John v or that other guy who likes viewing angles. The specs for the Surface 3 are beefy (and the price is high) because it has to run the heavy Windows OS. In some ways, this is a testament to the failure of Windows RT. There are no apps for Windows RT than anyone cares about. One might say "but it includes Microsoft Office", but this RT version of Office is not even the full capable Office. So Microsoft's tablet destiny is dependent on running an ancient desktop OS. This is a tough road.